Ever wonder . . . ? Here's your chance. Events large or small sparkle as Queen Elizabeth, looking remarkably like comic Carolyn Sadowska, arrives in her elegant regalia. 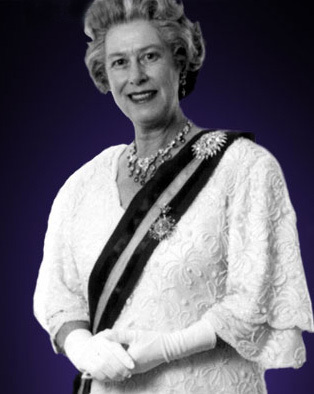 "The Queen" exchanges witty repartee while mingling with guests at your reception, acts as M.C. for the evening's entertainment, and/or entertains the crowd using comedy material relevant to the occasional. This remarkable and hilarious look-alike is perfect for conferences, conventions, staff parties and private functions like birthdays, retirements and anniversaries...in fact, any special event requiring a sensitive, intelligent and uplifting style of humour. It's all in good taste. It's fun, it's different, it's the finest display of a royal replica you've ever seen! She walks, she talks, she waves, she shakes your hand. Now really . . .
Will you ever get this close to the real thing? Noteable Entertainment & Events is a Vancouver based booking agency, party rental, entertainment services and event production company. If you are interested in booking The Queen please contact us.